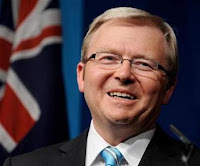 PRIME Minister Kevin Rudd won't tell Australians how to spend their stimulus bonuses, but says if he is eligible for the handout, he would blow it on books and music. Taxpayers earning less than $100,000 will receive a one-off bonus of up to $900, as part of the Federal Government's $42 billion stimulus package. Speaking on Nova radio in Sydney today, Mr Rudd was asked how he would spend the money if he was eligible for the bonus. "Some people have accused me of being a nerd from central casting,'' he said. I am not sure that Kev and I would have the same taste in books or music but I am pretty sure that I could quite easily spent $900 on them, if I didn't have other expenses! LOL I think I went and bought books with the stimulus check that Prez. Bush sent out a couple years ago. Try and have a little fun with some of it. That is a great idea - what a great feeling it would be to spend $900 on books! I'm actually going to take mine overseas to help boost the global economy! Lol, well I like him now! If only I could talk hubby into letting me do that! If only our Prime Minister would take a hint from yours!! No bonuses for us, no stimulus package for working families :-( Enjoy the books, let us know what you choose!! And could you imagine having that much money to spend just on books? I'm dreaming about all the books I could buy . . .
book nerds unite!!! great post--uplifting in a crummy economic time. And you can add another award to the recent influx! Funny - that is the coolest comment of a world leader ever! Sounds like a very cool man!